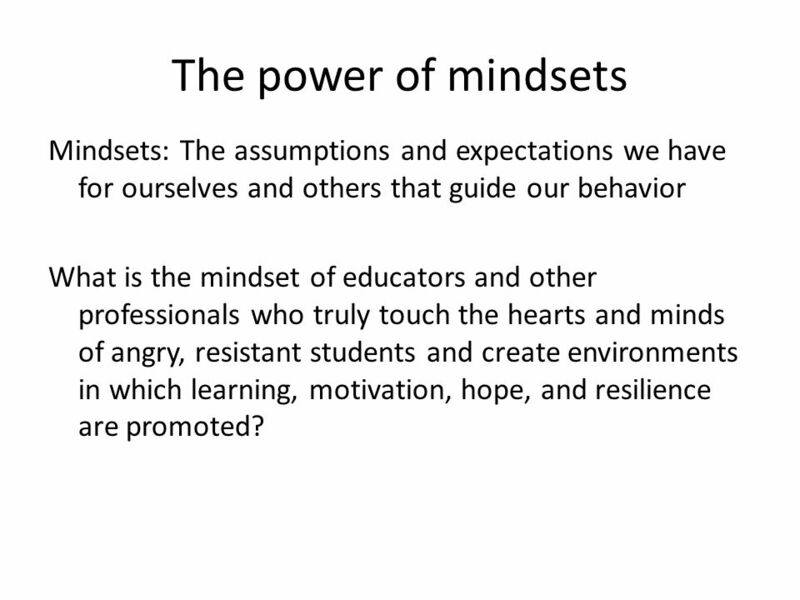 3 The power of mindsets Mindsets: The assumptions and expectations we have for ourselves and others that guide our behavior What is the mindset of educators and other professionals who truly touch the hearts and minds of angry, resistant students and create environments in which learning, motivation, hope, and resilience are promoted? 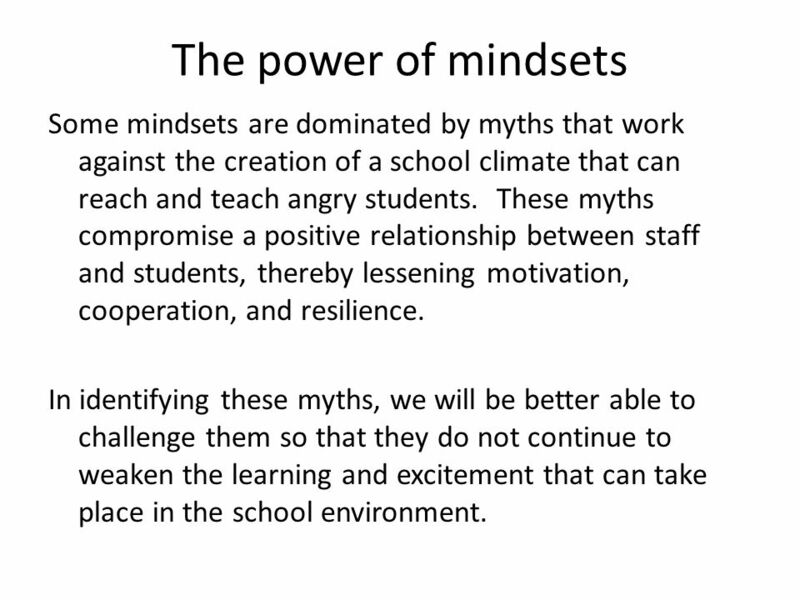 4 The power of mindsets Some mindsets are dominated by myths that work against the creation of a school climate that can reach and teach angry students. These myths compromise a positive relationship between staff and students, thereby lessening motivation, cooperation, and resilience. In identifying these myths, we will be better able to challenge them so that they do not continue to weaken the learning and excitement that can take place in the school environment. 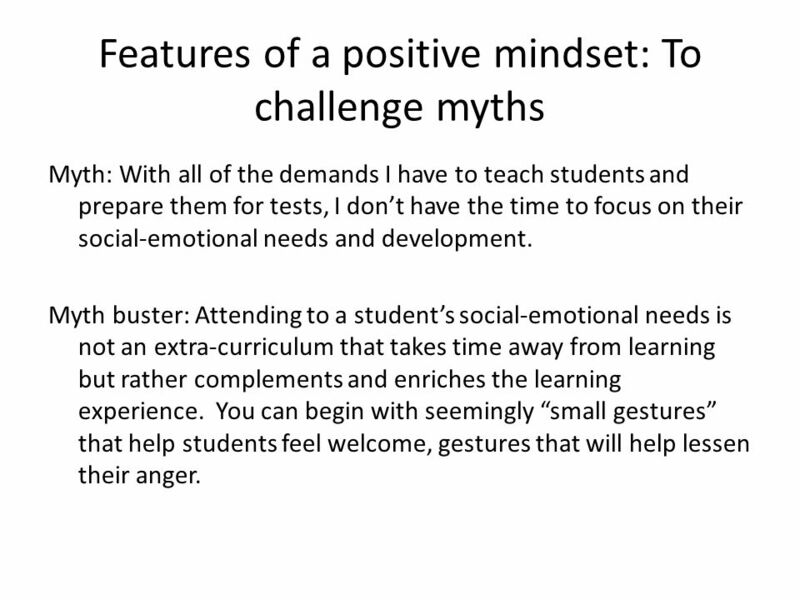 6 Features of a positive mindset: To challenge myths Myth: With all of the demands I have to teach students and prepare them for tests, I dont have the time to focus on their social-emotional needs and development. Myth buster: Attending to a students social-emotional needs is not an extra-curriculum that takes time away from learning but rather complements and enriches the learning experience. You can begin with seemingly small gestures that help students feel welcome, gestures that will help lessen their anger. 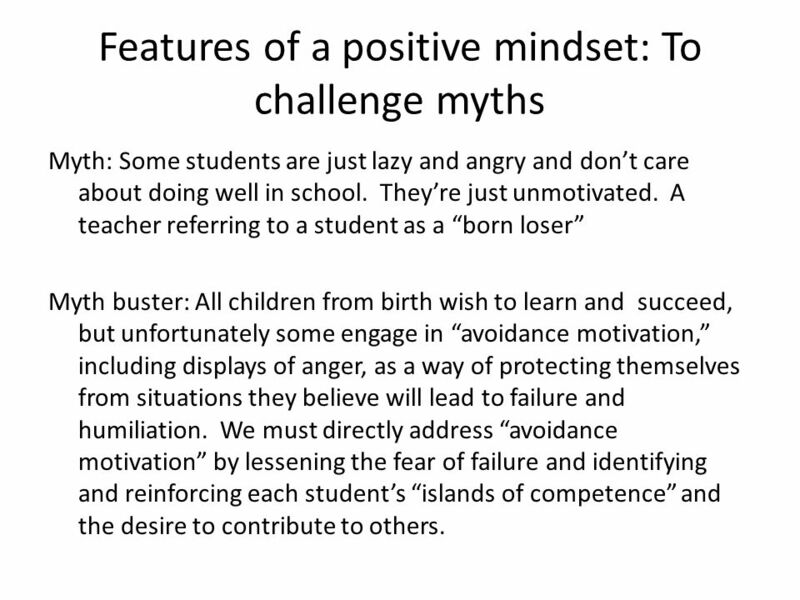 7 Features of a positive mindset: To challenge myths Myth: Some students are just lazy and angry and dont care about doing well in school. Theyre just unmotivated. A teacher referring to a student as a born loser Myth buster: All children from birth wish to learn and succeed, but unfortunately some engage in avoidance motivation, including displays of anger, as a way of protecting themselves from situations they believe will lead to failure and humiliation. We must directly address avoidance motivation by lessening the fear of failure and identifying and reinforcing each students islands of competence and the desire to contribute to others. 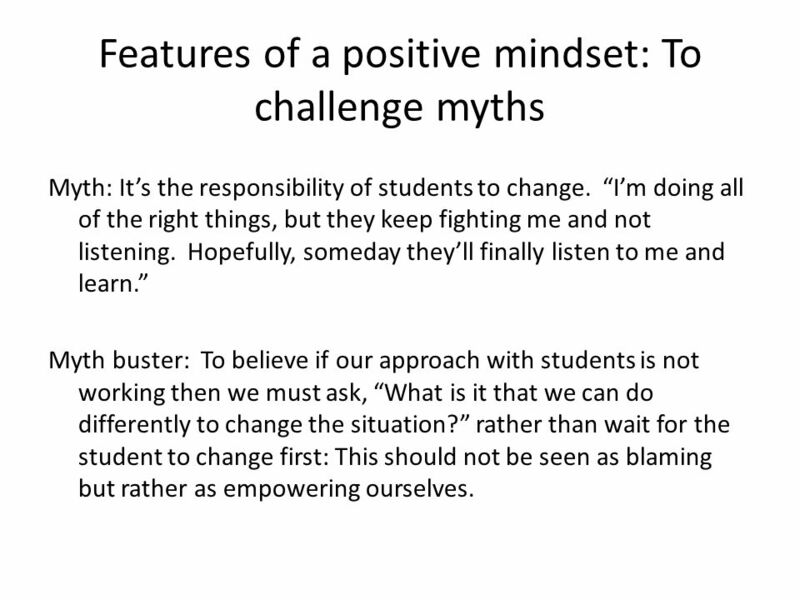 8 Features of a positive mindset: To challenge myths Myth: Its the responsibility of students to change. Im doing all of the right things, but they keep fighting me and not listening. Hopefully, someday theyll finally listen to me and learn. Myth buster: To believe if our approach with students is not working then we must ask, What is it that we can do differently to change the situation? rather than wait for the student to change first: This should not be seen as blaming but rather as empowering ourselves. 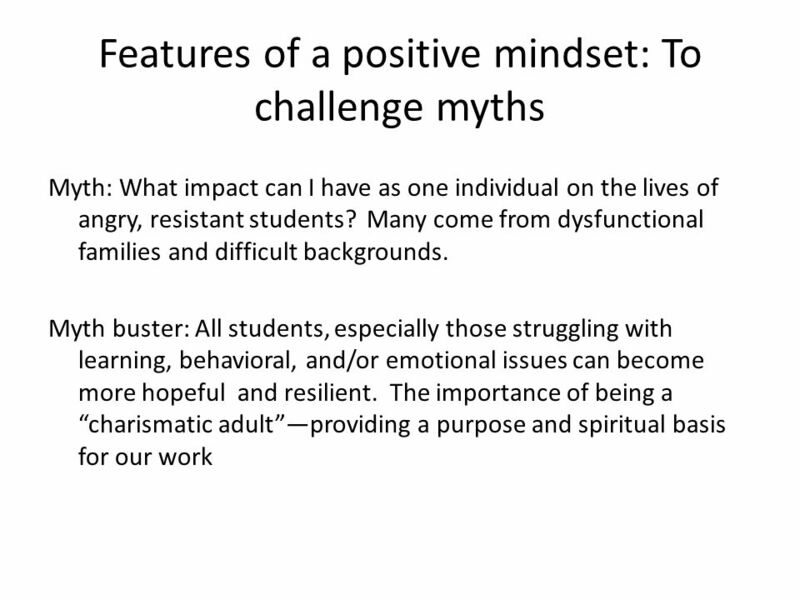 9 Features of a positive mindset: To challenge myths Myth: Students need to be told what to do or else we will be letting the inmates run the asylum. We give kids too much power these days. Myth buster: Students must be active participants in their own learning. A sense of ownership is a vital component of intrinsic motivation. There are ways we can promote these qualities in our students without abdicating our own responsibility and authority. We can provide choices and encourage student feedback and involvement. 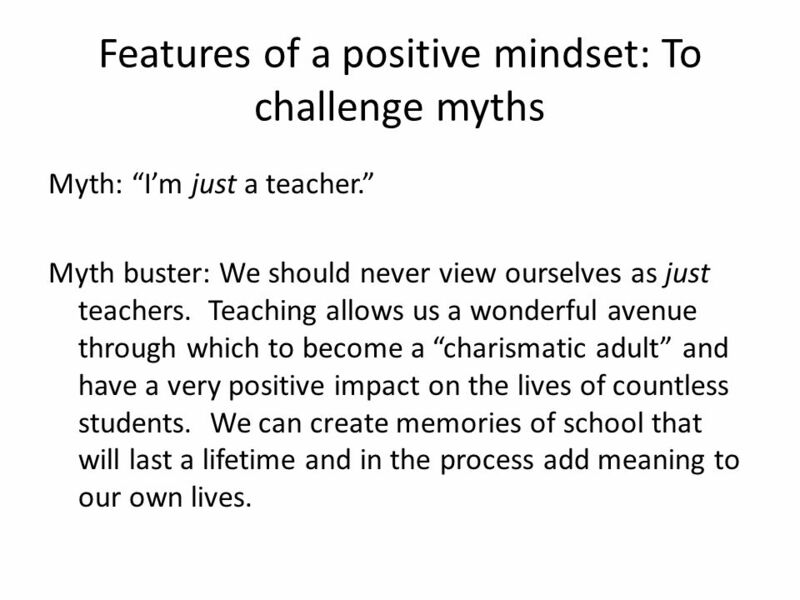 10 Features of a positive mindset: To challenge myths Myth: Im just a teacher. Myth buster: We should never view ourselves as just teachers. Teaching allows us a wonderful avenue through which to become a charismatic adult and have a very positive impact on the lives of countless students. We can create memories of school that will last a lifetime and in the process add meaning to our own lives. 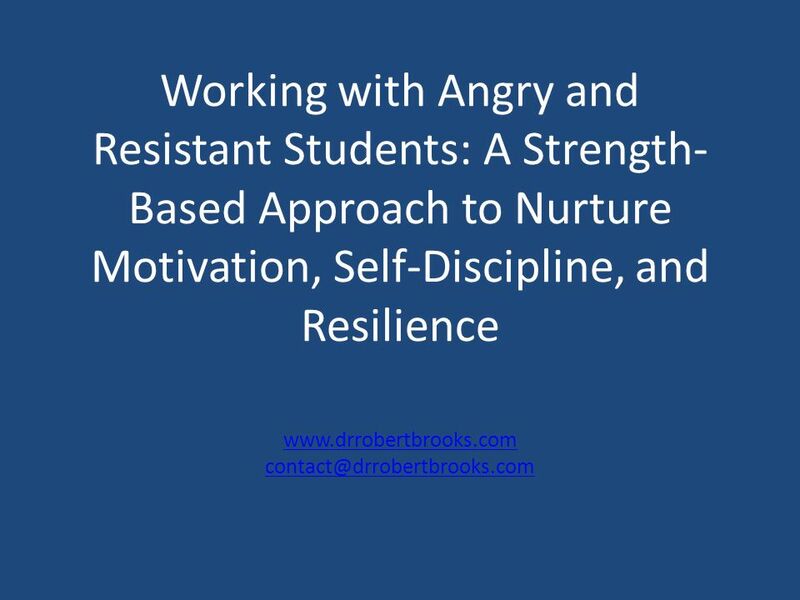 Download ppt "Working with Angry and Resistant Students: A Strength- Based Approach to Nurture Motivation, Self-Discipline, and Resilience"
Resilience, Learning Styles, and Self Discipline Larry Schanus Psy. D. Licensed Psychologist MCF/SHK April 8, 2010 Copyright Larry Schanus 2010. Love and Logic Kathy Utter Kate Wessel Introduction Love and Logic A strategy used to reduce the reactivity of adults to students by setting firm limits. St. James High School PLC Days November 11, 25, and December 2. Dr. Marion Bish July 23,  Introductions  All questions are welcome  100% participation  Why is this topic important?  What do you hope to learn? Consequences Parent Fair November 12, 2012 Allen ISD Middle School Counselors. Why should they care?. A model for motivation  Expectancy  Your expectation about your ability to accomplish the task  Am I capable and prepared to. Overcoming Fear What am I So Afraid of? Am I afraid to fail?